Update 1: Wet Dog, another Banksy street piece which was up sale in the same auction as Slave Labour, was also withdrawn at the last minute. Wet Dog was recently shown in the controversial Banksy: Out of Context show in Miami last December, where it was reported that the piece was not for sale. The Banksy street piece shown above (named Slave Labour (Bunting Boy) by the auction house which was trying to sell it), which a few days ago we mentioned was up for sale at an auction house in Miami, did not end up selling at the auction yesterday as had been the plan. Instead, the piece was withdrawn from auction, there has been a public outcry to return the piece to its original site, and investigations by British police have begun into how the piece was removed from London and put up at auction in the first place. The local outcry about the piece’s removal reached a particularly hilarious point when a member of the local government arranged a protest requesting that the piece, which presumably was painted illegally, be withdrawn from auction and returned to its original location. Sounds like they might be successful in that effort, but I expect that the piece would be quickly destroyed by haters and/or street art/graffiti purists if it were returned to the street at this point. Even the FBI got involved, asking the British police to investigate the origins of the piece. It’s still not 100% clear whether or not the piece was removed from the street with the permission of the property owner, but the owner has so far refused to comment, so at this point I’m guessing that they saw a chance to make a few bucks and organized the removal themselves. While we’re on the topic of Banksy, I’d like to discuss dispel two Banksy-related rumors that popped up elsewhere on the web last week as a result of a lack of fact-checking by journalists and bloggers. The Haringey Independent has published two stories about what they call “a new ‘Banksy'” on the same street where the Slave Labour piece once was. The piece is a stenciled image of a rat holding a placard with the question “Why?” on it. 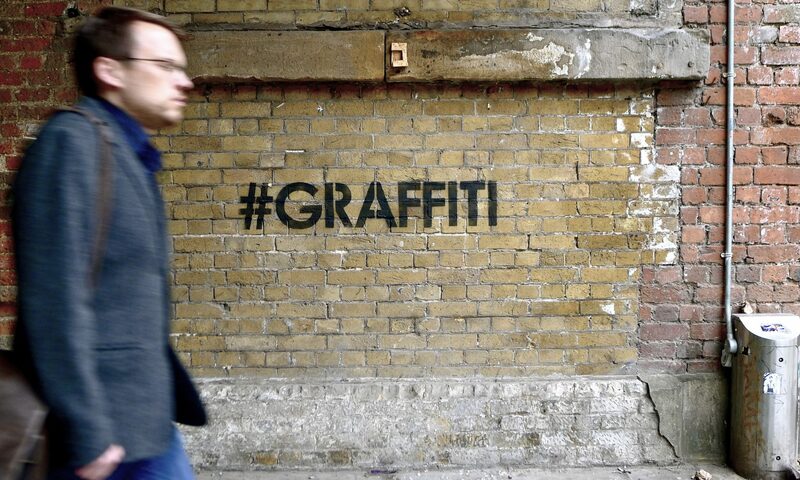 The only hint in either article that the new stencil might not be by Banksy are the quotes, but there’s no real discussion and it’s basically assumed that the piece is legit. After even just a quick glance at the piece, I’m 99% certain that it was not done by Banksy, but was just an homage and comment on the removal of the real Banksy piece. The rat stencil is poorly cut, poorly sprayed, the font on the placard isn’t one of Banksy’s standard fonts, I don’t believe Banksy has done a 1-layer rat stencil since 2009, and (save for the Banksy versus Robbo events) I can’t think of any instances of Banksy doing a street piece which directly addresses a specific controversy of his career. Of course, the funny thing is that the property owners where this new rat is seem to think it’s a real Banksy, since the second article reports that the non-Banksy is now covered in a protective layer of plexiglass. 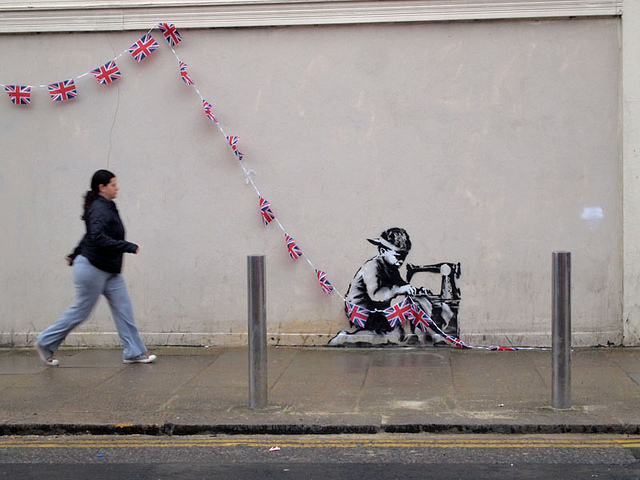 And then there’s the hoax story that Banksy was supposedly arrested in London last week. A press release posted to prlog.org claimed that Banksy had been arrested. The news quickly spread on Reddit and Twitter. Although the press release was quickly removed from the site, UK Street Art has the full text available. Give the press release a read. Think about it for a second. Does it sound legit? Blogs such as Jezebel and Death and Taxes, and Clutter Magazine reported the story as fact. At least Complex.com made clear that the release was basically an unconfirmed rumor. If those blogs wanted some hits, posting that press release without actually thinking about it was probably a good move. But it wasn’t too difficult to determine that the press release was a very likely hoax, even before it was removed from prlog.org. And the press release was a hoax. Betabeat has a good brief summary of how the hoax happened, some reasons why it was a hoax, and who was behind it (it seems that site was). Reddit and The Banksy Forum have more detailed discussions as to why the press release was clearly a hoax. With Banksy, things are rarely 100% clear, which opens up the door for hoaxes (I can’t think of any off the top of my head, but I’m sure I’ve fallen for one or two before), but if we exercised a bit more caution, perhaps these kinds of hoaxes and misattributions wouldn’t be quite so common.